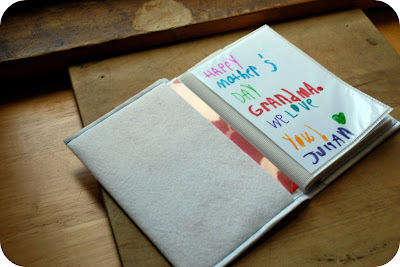 Anyway, this is really easy--you can easily whip this out in under an hour because all you are doing is making a little custom felt book jacket for one of those cheap plastic photo books. Because I planned to fill my photo books with photos of Beeper, I also had him make a little self-portrait that I could put on the cover (Beeper calls those wavy lime-green arms "lava limbs"). 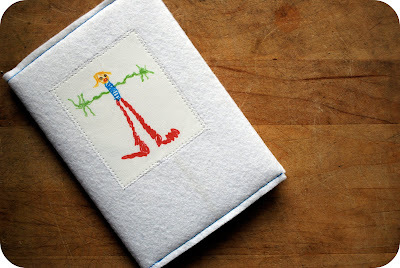 I scanned the drawing and printed it on printable fabric sheets--but you could also embroider the image or even have your child draw the image direct on some fabric using fabric markers, depending upon what you have on hand and what works for you. 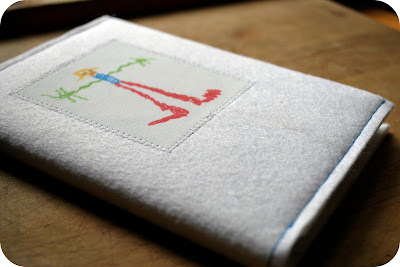 And also, I only had enough wool felt on hand in white, so that is what I used for the cover, but really, you could use any color that suits you--although I kind of like the clean look for the white cover with the contrasting turquoise blue stitching. 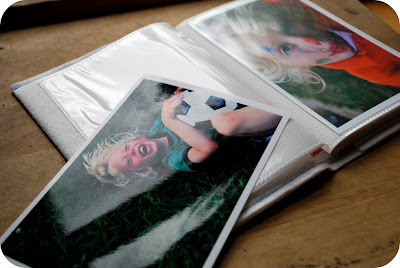 And then once you make the cover, you need only fill it with photos--or handwritten notes from your child or you--or even some little drawings...whatever appeals and will fit in that little photo pocket slot. This is great. I just love coming to your blog, you have so many great tutorials for a newbie sewer like me as well as great links with other great ideas. Hey thanks, Erin--and thanks for coming by. I always like the company. Aww, this is so cute! Thanks so much, I'll be linking. The cover is a really cute idea. My little girl has just started drawing, and it’s inspired me to start digitalising kids art and embroidering it http://www.2greenmonkeys.co.uk/kidsart.htm. But you can do it by hand too … I think it’s a great way of treasuring kids drawings forever.